A situation at work required my presence, so once again Original Ken provides the photos. We have several nice customs in this update, so get to the photos! I apologize for both the haziness and smallness of this first photo. OKen took a wide “group photo” of some of Big Tractor Mike’s Tomica stock. Thus, no particular item was really in focus. Also, since the pic was comprised of such a large number of boxes, even at full resolution (which this is) each box was smaller than our standard photo size. nonetheless, I was intrigued — not to mention a bit creeped out — by this freaky spider crane model. I swear, it looks like something that could be part of ROTF Devastator. Or, maybe it’ll be Spidey’s new ride in “Into the Spider-Verse”. Here’s something that will make your eyes happy again: Ken’s beautiful photo of BTM’s Custom T-Bird (original Redline). No, it’s not a garbage truck, yet I’m still surprised that Ken did not buy this Viking street cleaner. Some nice mechanical detail on the rear panel. Renault 5TL and Ford Group 6, both by Matchbox. Actually, Ken had all three of these models staged in a single photograph. However, somehow this ’77 edition was accompanied by a sweeeet reflection — on the pleather pool table cover, yet! — and I just had to showcase it. Original Ken: Le Artiste Photografique. 1983 Extras Series Upfront 924 — the extra being the snap-on ski rack. As I pointed out back in August of 2010, the ski rack isn’t merely some vaguely ski-shaped pieces; there are two pairs of poles with baskets, and two pairs of skis with boot bindings. And thanks to Ken’s hi-rez camera, you can see this even more clearly now. The fact that the rack is shot through the rear window is, apparently, of little concern. Two Tyco Corvette slot cars, which Ken sold to Scott. And now, we get to the customs. These first two photos feature another farm display by BTM, which includes two custom handmade trailers. The original of the above photo had quite a tilt, which sharply cut off the road piece. I was able to rotate it, but had to crop out the sharp road end because it looked like it was just falling off into space. I appreciate how a few pieces of green shred appear to be shrubs when in context with the vehicle models. An M2 Machines pick-up, customised by Doug for Mike. 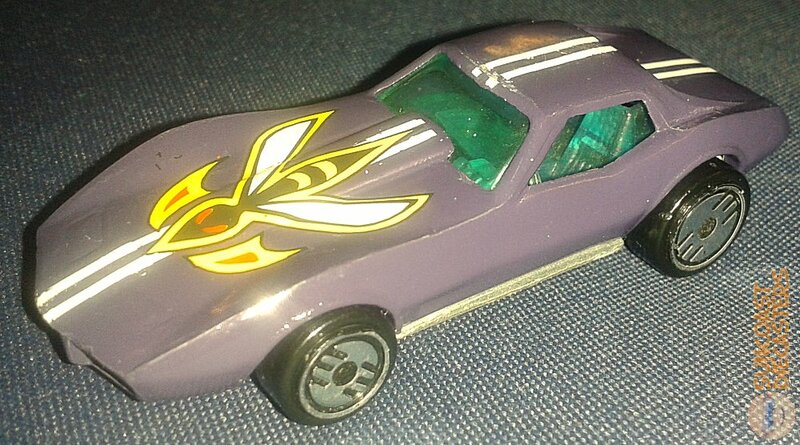 And for our Find of the Month(*): ’76 Hot Wheels Corvette Stingray, with custom paint and tampo by Jim. Bought by Bill. Nicely done, Jim, and well-chosen, Bill! And with half a week of June left, I shall treat myself to a cheeseburger in celebration! See you at our July meeting! This entry was posted in Slot Cars, Tomica and tagged Customs. Bookmark the permalink. ← May Update is Up, Up and Away!